We should check this one out, he writes, on a restaurant review in last Saturday’s paper. ‘It’s a date’ I write and ‘look at this’, I go on, circling a home exchange advertorial that suggests that we could up sticks for a couple of weeks and swap our farm house for a Manhattan penthouse. We get cocktails, you get milkshakes and oh so much more besides. And here, Mr and Mrs New Yorker, if you could milk the cows; that would be great. I leave a sandwich, he eats it. He leaves a pile of washing; guess what, I wash it. ‘Don’t forget’, I write on a post-it, ‘to ring your man about the concrete’. ‘I won’t forget’ he writes back. ‘Good’ says I. He records our favourite programme, I watch it. He texts at bedtime to see how the kids have settled to sleep. They miss Dad I write and then think again and erase it, text instead ‘good, they’re all sound’. And then the rains stops and the cows go out. They can, at long last, spend time outdoors during the day. And as he fences around the house to leave the cows out, we arrive, en famille, to ‘help him’ fence, we fill in the gaps between the scraps of newspaper, texts and sandwiches. The Spring or the intense calving period is coming to an end. We’ll be there to walk the cows out with Dad. To bring them in for milking, to let them out. 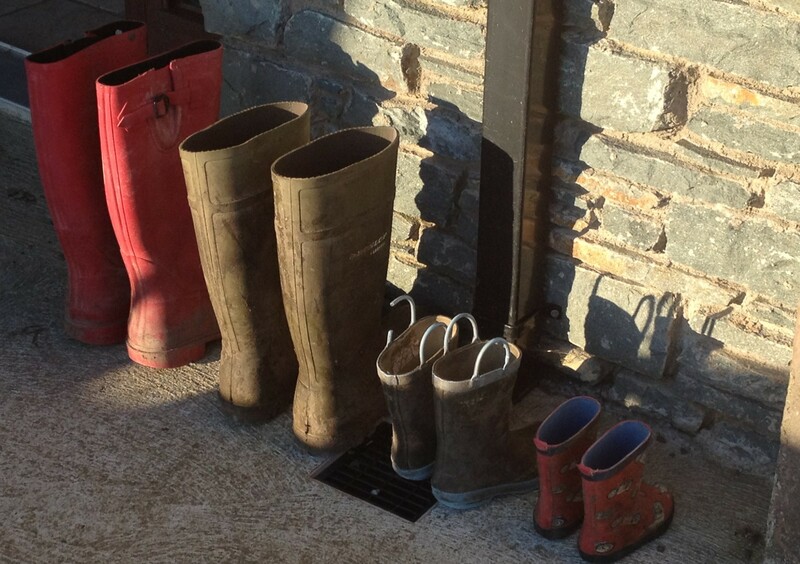 In our wellies, chatting to fill in the Springtime gaps. Spring takes him away, the cows out in the fields brings him back. That most certainly is a date. This entry was posted in Uncategorized on March 27, 2017 by annebennettbrosnan.